As 2018 comes to a close, it offers an opportunity to reflect on the past year and how we can continue to help close some of the opportunity gaps that persist in our society. Core to our values as a company is investing in causes for the long term to make a tangible and meaningful impact. Today, we are proud to share some significant milestone moments that have had a positive change on our communities. Our Internet Essentials program truly exemplifies what happens when we use one of our greatest strengths – technology – to open doors to new opportunities. Since the program launched, we’ve reached more than 6 million low-income Americans and connected them to the power of high-speed internet in their homes. From helping students complete homework assignments to parents and veterans who can more easily apply for jobs, access to the internet offers endless possibilities. Digital literacy and access to technology are critical for more people to participate in the digital economy – including young children aspiring to bright futures. We’ve provided $500+ million in cash and in-kind support since 2011 to fund digital literacy training and awareness. Recently, to support our release of The Grinch, we partnered with a nonprofit organization to create an online game starring the Grinch to teach coding basics. Featured during the national “Hour of Code” week this December, the game has already reached more than 1 million users and will be distributed to dozens of nonprofits for their use, including City Year as well as Boys & Girls Clubs, with 4 million members around the world. Members of the military community are some of the most capable and adaptable employees, who are also skilled at earning trust, building relationships, and taking on leadership roles – and that’s why in 2018 we announced our commitment to hire thousands of additional military community members, bringing our total to 21,000 military hires by 2021. We also seek to serve military spouses who face their own challenges, and focus on programs that build a supportive workplace culture for everyone. Diversity & Inclusion is not just a program or initiative, but part of our DNA. We are committed to attracting, developing, and retaining the best talent from all backgrounds and providing paths to help people grow and develop their careers. More than 60% of our Comcast NBCUniversal employees are women or people of color, and over half (52%) of all employees across Comcast NBCUniversal report to a woman or person of color. In addition, we have spent more than $16 billion with diverse-owned suppliers since 2010, including more than $4 billion in 2017 alone. We believe it’s this commitment to diversity and inclusion that makes Comcast NBCUniversal such an incredible place to work, and earned us recognition as the No.2 “Best Workplace for Diversity” by Fortune and the Great Place to Work Institute. Service is fundamental to our culture and there is no more universal example of that throughout our company than Comcast Cares Day. 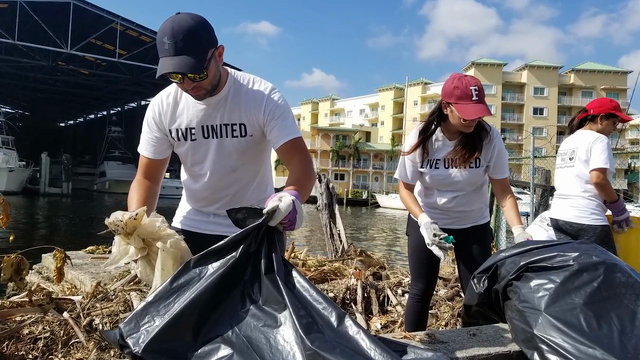 Our signature volunteer effort highlights the work our employees do each and every day of the year in our local communities. Last April, we celebrated surpassing 1 million Comcast Cares Day volunteers since 2001, by surprising our millionth volunteer, who was at Michigan’s largest LGBTQ community center to help clean and spruce up the surrounding grounds. We are consistently humbled by our employees’ commitment to prioritizing others and their local communities, including students. More than 1,000 of our employees have volunteered as “Bigs” through Beyond School Walls, the nation’s largest workplace mentoring program with Big Brothers Big Sisters of America. We celebrated our 10th program anniversary this year, and our employees who volunteer their time to transform children’s lives. And it is not just our employees and their families immersed in service who are making a difference. We exceeded more than 100 Comcast NBCUniversal-sponsored City Year teams since our partnership began in 2003, and the members of these teams volunteer a year each to collectively keep thousands of children on the track to graduate high school. At this year’s “Opening Day” ceremonies, a new class of young people committed to ensuring students find new possibilities, believe in themselves and realize their full potential. Reaching people no matter where they are in life and providing them with resources to position themselves for success is an essential part of our community engagement. To date, we have provided nearly $30 million in college scholarships to high school seniorsthrough our Leaders and Achievers® Scholarship program. And thanks to the incredible generosity of our employees’ contributions this year, our company has now contributed over $100 million to United Way to help local communities – giving millions of individuals and families nationwide access to the basic needs of food, education and housing. 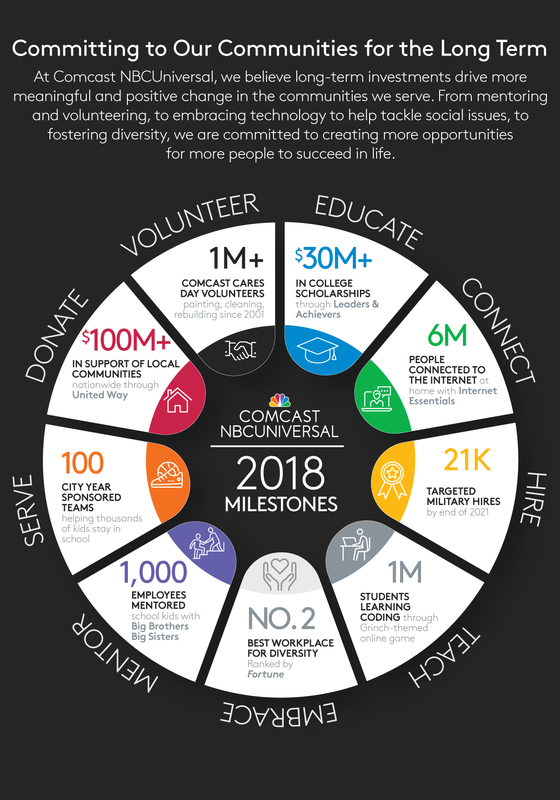 As Comcast founder Ralph Roberts often said, “The healthier and more vibrant the communities are where our employees and customers live and work, then the healthier and more vibrant our company is going to be.” These are just a few of the ways that we bring this value to life every day. We look forward to continuing this work and seeing the changes we help make happen in our communities in 2019.